I've recently finished my Junior year of high school, and begun the eighteenth summer of my life. For a kid, as for most of my existence I have considered myself to be, and, indeed, have been, that's a thrilling and unnerving and surprising and yet perfectly fitting place to be. It's where I am, and it's where I ought to be. I may feel like age twelve really is not that far away, but I did do the work: I lived through thirteen and fourteen and fifteen and sixteen, the whole years. Never skipped a day. Memory is an odd thing. Time, history, perspective. My Camp NaNoWriMo novel is set in Minneapolis in 1907. I did some research, and my jaw has literally dropped several times. Exhibit A: We no longer have camels in Longfellow Park. 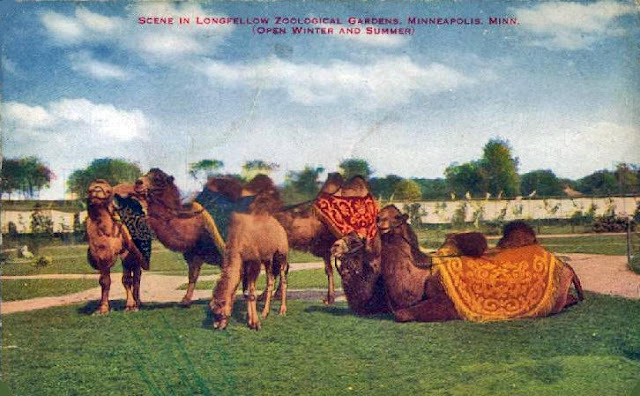 Exhibit B: You know, sometimes I've wondered if Minneapolis even existed in the '20s. I mean, I hear few people telling stories about those days. Maybe I'm not well enough read, but from nowhere but the most obscure of books (Lost Minnesota: Stories of Vanished Places, an excellent pictorial tour of history Minnesota has lost, and another book, a quite strange but fascinating history of a family in the late 1800s in St. Anthony, the title of which I've forgotten) do I have even a flavor of what the city was like in the old days. Where did the ruined businessmen of the Great Depression work in downtown? Where did they buy their hats? Their newspapers? 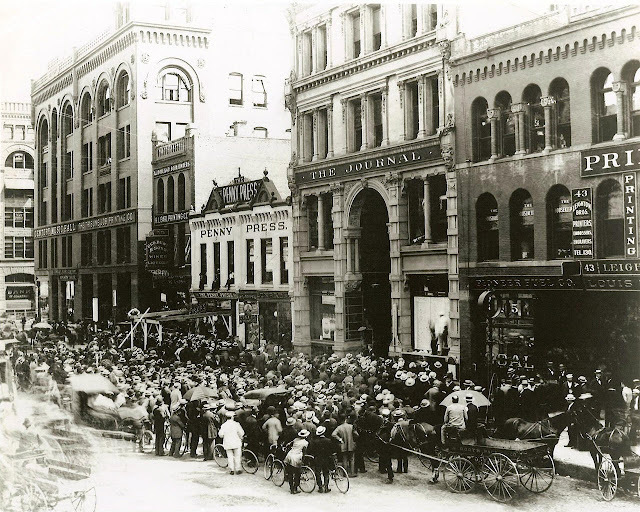 Behold: Newspaper Row of 1897. Forgive my blindness to the obviosity of history (I was paying attention on our field trip to the excellent riverside Mill City Museum, and when I went to the Minnesota History Museum once in sixth grade, and I know that Minneapolis existed in the '20s), but like eternity future and the return of Christ, the reality of finity past takes faith and quite a lot of mental exercise to realize. 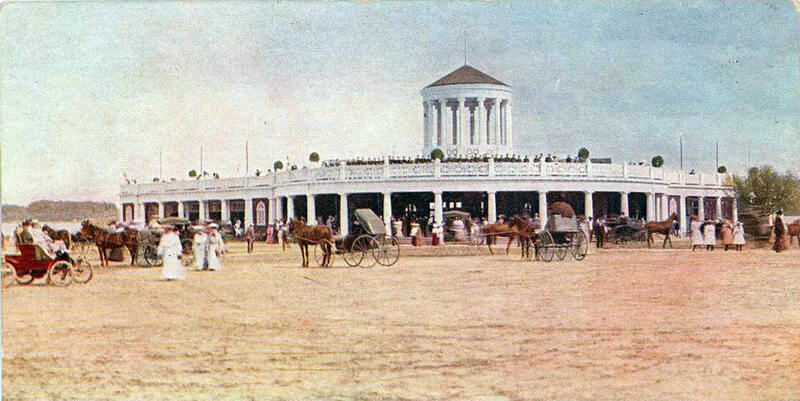 It just hit me a little harder when, in the course of one day, I walked along the shore of Lake Harriet and heard the cheering of a crowd at the Bandshell, and looked at pictures of what it was like a hundred fifteen years ago. 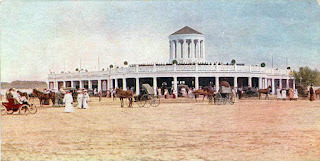 Exhibit C: the Lake Harriet Bandshell built in 1986 and standing today (or at least it was on Friday), and the Lake Harriet Pavilion of 1905, which burned down, to be followed by several other burned-down structures. Times have changed, and so have I, and it's hard to remember the old days. i enjoy this a lot :) keep it up!